Eight different stripes kits were used in 1968. Stripes came in three colors, blue, white and black. Each model used its own unique rocker panel stripes. Black stripes were only used on GT350s and GT500 KRs that were painted yellow. The blue stripes were only used on white cars. All others cars received white stripes. Several of the kits are hold overs from previous model years. In 1968, the model designation is always centered on the front fender. This a change from the 1967 stripes. 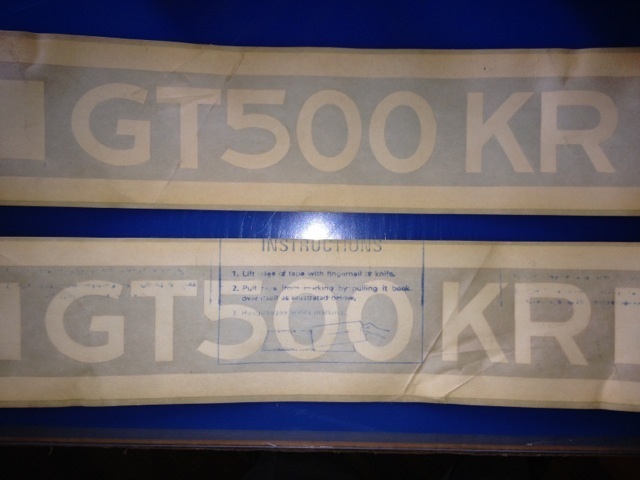 The GT500 KR used a different style of lettering (font) from the earlier GT350 and GT500s. Over the years, several different vendors have made reproduction stripe kits. Most kits are not accurate to the originals. 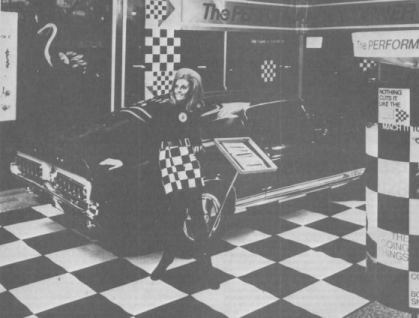 Most 1968 rocker panel stripes were applied by two female, AO Smith employees. Margaret Moon was one of these ladies. The two ladies striped about forty cars each day. If you do the math, they spent about ten minutes on each car and stripes were aligned by eye. Here are the part numbers for the stripe kits. 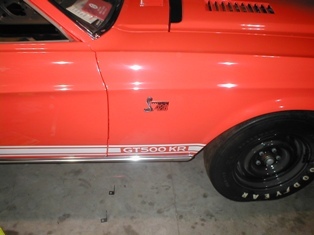 No yellow GT500s were built, so there was no corresponding black GT500 stripe kit. This is an NOS GT350 stripe kit. These stripes are the same as many of the earlier cars. Note the letters are a "block style". The length of the center, horizontal stripe has a space about 12 1/2 inches for the call out. Original stripe kits were made on 3M paper. However many of the reproductions also used the same 3M materials. Looks for these instructions on original stripe kits. 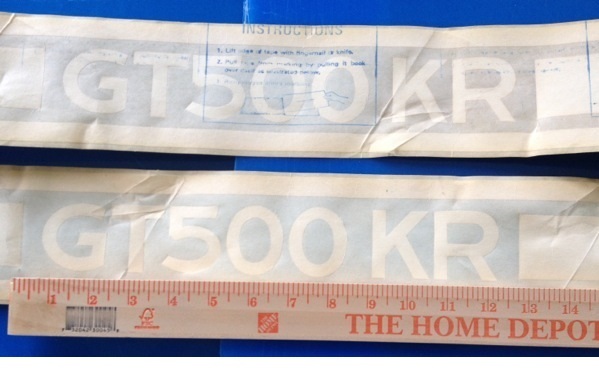 The original GT500 KR stripe blueprint has been found! Now, you can see the actual Shelby Engineering drawing of the stripe and font. It was drawn on 3/30/68. This is a NOS GT500 KR stripe kit. The KR stripes used a different font. Look at the zeros. They are round, not egg shaped. There are no dots after the GT letters. The spacing for the letters in the center stripe is very similar to the other models. It is approximately 12 1/2 inches. Now you know why the font had to be changed. Several other stripes were actually planned, but never used. These include Paxton stripes, Hertz stripes and a "GT500J". 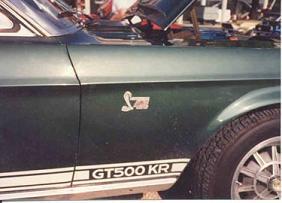 My best guess is the "GT500J" was the original version of the GT500 KR stripe. The "J" was for "Jet". During 1968, the factory did not paint Rally stripes. AO Smith, the subcontractor, that built the cars had a very narrow set of restrictions and all cars were built to a standard. Rally stripes could have painted on by a dealer. I suspect this was quite rare. The stripes breakup the letters "SHELBY" on the nose and decklid. I like to think of these stripes as "over-the-top". All GT350s and GT500s received the same emblem. It was a die cast metal coiled snake with the "COBRA" underneath. The factory attached a template to the fender to drill three holes. Each of these holes is for a barrel nut. The emblem was then pressed into place. GT500 KR emblem seem to cause people the greatest trouble. These emblems used a two sided sticky adhesive to attach to the fenders. Let's take a look at how to properly postion the emblems. 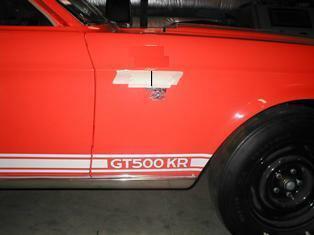 This picture is an unrestored GT500 KR. Note the round zeros in the stripes and the height of the emblems. I recommend you stripe the car first. The rocker panel stripes will help align the fender emblems properly. 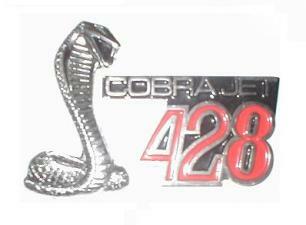 The first thing you need to know is the snake is ALWAYS to the left of the "Cobra Jet 428" script when you look at the car. I have drawn some lines on the emblems, to create an "emblem box". This box will help you postion the emblems on the fender. 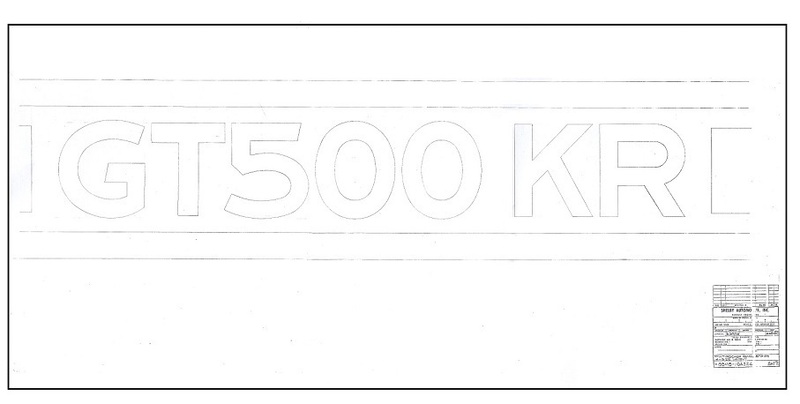 The vertcial centerline of the emblem box should be centered on the "GT500 KR" script. The top horizontal line is 2.25 inches below the center of the fender highlight. Original cars varied slightly between 2.25 and 2.50 inches. The bottom of the Cobra snake is rounded. Be careful not to rotate the snake. The tape in this picture is 2.25 inches high. The vertical centerline is marked on the tape in black. The "Cobra Jet 428" emblem is positioned as shown. After removing the guidelines, position the Cobra. Here are the emblems in their proper locations. 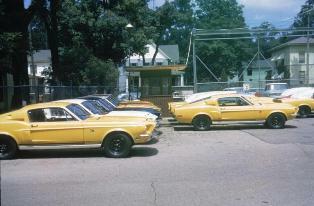 This photograph shows yellow GT500 KRs at the factory. Take a closer look by clicking on the picture.